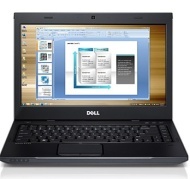 alaTest has collected and analyzed 42 reviews of Dell Vostro 3450. The average rating for this product is 3.9/5, compared to an average rating of 4.1/5 for other products in the same category for all reviews. Views about the screen and portability are generally positive. The design and usability are also mentioned favorably. Many are negative about the battery and sound, and there are some mixed opinions about the keyboard. We analyzed user and expert ratings, product age and more factors. Compared to other products in the same category the Dell Vostro 3450 is awarded an overall alaScore™ of 83/100 = Very good quality. The Vostro 3450 is a business class notebook sporting a 14-inch, 1,366 by 768 resolution LED with a 2.10GHz Intel Core i3 processor. This laptop offers good aesthetics and build quality, besides giving a good performance and access to upgrade RAM and hard drive.